All the hard work is done. 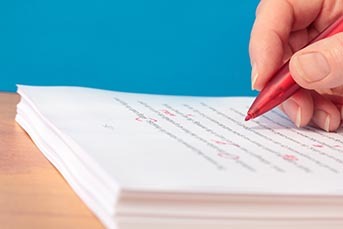 You have finished writing your book, it has been proofread, the corrections have been made and all that remains is to format it to meet the requirements of your printer. This, however, is the point at which most people get stuck! What pages should be included at the front of the book? Do I need to include the ISBN and, if so, where and in what format? Where should I add a dedication page? Do I have to have a table of contents? Where should the “About the Author” page go? What are the printer’s requirements for such things as margins, bleed and trimming? What are the size and resolution requirements for images? How should I format running headers and page numbers? What are the conventions for starting new sections/chapters and splitting paragraphs across pages? And this is just for the book’s interior. The cover is a whole new ball game! WMC Publishing has helped literally hundreds of new and well established authors to get their book interiors and covers formatted to meet the needs of a variety of different distributors. Most importantly, we recognize that every book is unique, and that the amount of work involved in transforming a raw manuscript into a print-ready interior file can vary from just an hour or so to several days. For this reason we do not offer our service at a fixed price but, instead, will assess just how much work is involved in each individual project and provide you with a personalized quotation. This allows us to keep your costs down to a minimum and ensures that you pay only for the formatting work that is needed to get your book into print. So, why not give us a try. Just click on the link below and we will be happy to give you a FREE, No Obligation Quotation for your manuscript conversion. In addition to WMC’s general book formatting service, we also offer two specialist formatting services aimed at authors who publish puzzle books.